Sikandra, May 31: The Archaeological Survey of India is trying to restore the pristine beauty of the tomb of the great Mughal emperor Akbar at Sikandra near Agra in Uttar Pradesh as the monument has lost its sheen over the time. The Mughal rule in India during medieval times witnessed a lot of architectural activity that led to the construction of many fabulous monuments. 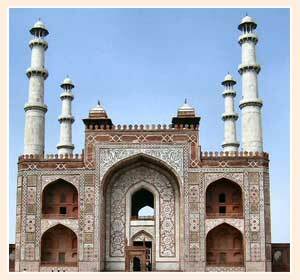 Akbar`s tomb is an excellent example of assimilation of different styles of the architecture of his reign. "Akbar was a very eccentric king," says art historian Shobita Punja. The tomb was built by his son Jahangir. It is based on the pillar and beam principle.